Have been using these tubes for a few years now, they hold up pretty well. I ride 1,300 mi. a year, mostly on the road, still get one or two flats a season, but that might be in part to well worn tires. They hold air pressure much better than an average tube, I always try to keep one of these on hand, but last year I had a flat and the bike shop put one of their tubes on the front wheel. I noticed after a couple weeks the wheel with the Michelin tube will have 10 lbs. more air in it than the bike shop tube. Living up to its advertising. I have around 200 miles on these tubes at the time of this review. Installation was easy, valve and keeper nut seem of good quality, and so far the ride is great. I run my bike with 70 PSI of air in the tires and over a couple weeks I haven't really lost any PSI of pressure when I put a gauge on. Great tube for the money. I run them with tire liners on city streets. (lots of road hazard here) I have not had a flat for 4-5 months. I ride 75 - 85 miles a week . I would definately recomend this tube. I had these tubes on my bike for around 40 miles now. A few weeks ago my rear tire and tube were punctured by a screw on the road. The tube hardly leaked any air and I was able to ride four miles home. The next day when I checked the air pressure prior to repair, there was only a three pounds psi loss from the previous day. These tubes do hold air when punctured! I highly recommend them. I use these tires on my gravel bike. I ride about 22 miles each day. Initially the tires were very stiff and cornering felt uneasy to me. After the first 100 miles, this effect was completely gone and corners nicely now. Here in Arizona we have to deal with A LOT of thorns and goat-heads from trees and plants are really hard on tirestubes. I've got over 300 miles on the tires now and not one flat tire! So far, 200 miles inside Michelin Protek 700c x 35mm commutergravel tires, no punctures despite lousy streets, gravel trails and tree debris. Happy so far. A fairly robust tube - I use these on my '07 Jamis Supernova - the bike I subject to the most abuse - rain, degraded tarmac, dirt, gravel, grass, lunchtime rides from work, and so forth. They usually hold up pretty well. This tube replaces one that'd been on for a couple of years but got punctured when its Clement Xplor Ush was holed by a thorn-sized pyramid of sharp glass. This tube is not thorn resistant. Excellent tube that was easy to install. The tube is excellent and durable. It accommodated my 700x50 tire. I ride mostly around town, but occasional on gravel trails. I wanted something that would hold up to some punishment. or stop leak as advertised. Just another overhyped overpriced cheap quality tube. Decent weight, good price. Not a whole lot to say, they are tubes. These tubes run heavier than the latex tubes but are well worth the added flat protection. I seem to get a lot of flats on my CX bike and went with this and so far have been really happy and (knock wood) no flats. Great Match with Michelin City Tires! 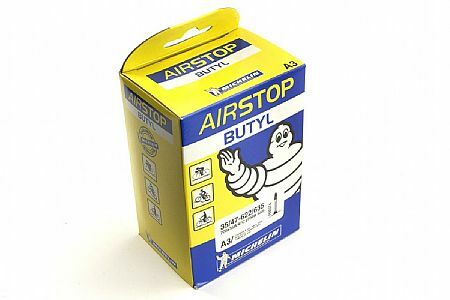 Bought these tubes at the same time to match up with newly purchased Michelin City 700 tires for my and my wife's Hybreds....put them on myself and had no problems with the tubes fitting properly in the tires. Perfect Match! Bought two A3 Airstop tubes. After about 300 miles, the reinforced rubber where the valve stem meets the tube gave way. I will give two chances, but not three. Am using these tubes on a Cannondale Hybrid. The tubes are well-constructed, unlike the cheap tubes carried by my local bike shop. The stem length supplied is just right for the rims. The tubes installed easily and hold air well. They are a good cross between light and durable. I bought an extra tube to carry around in case of a flat. The shipping was fast and accurate and the prices reasonable. A good first-time experience with this vendor.